The Site Information page is the place where you will be able to configure the basic settings for your website and in the next few lines of this tutorial we will provide you with more information on how this should be achieved. First let’s begin with accessing the Site Information configuration page. The page is available under your Admin menu>Configuration>System>Site Information. There you will notice few sections being displayed. Let’s begin with the first one called Site Details. 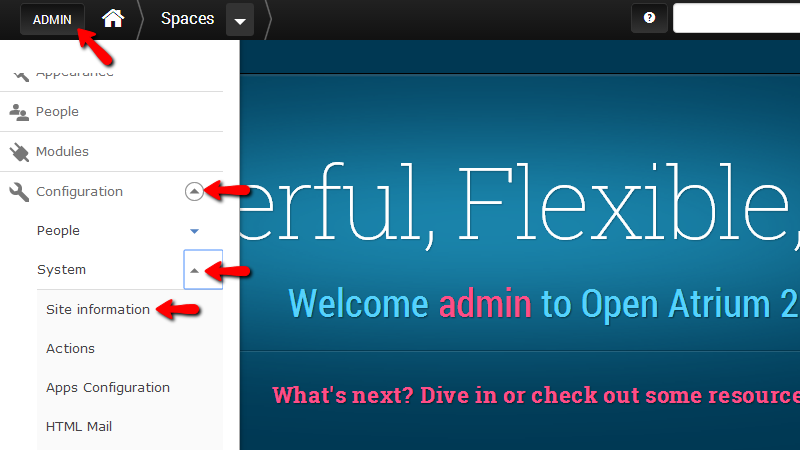 Under that section you will notice 3 fields you will need to configure. E-mail address – the email address that should be used when your website is sending emails. With the default installation of Open Atrium the home (langing) page of your website will be the default page of the platform. You probably would like to configure a new page within those you have created to be set as the new landing page of your application and in the next section called Front Page you will be able to perform that change. 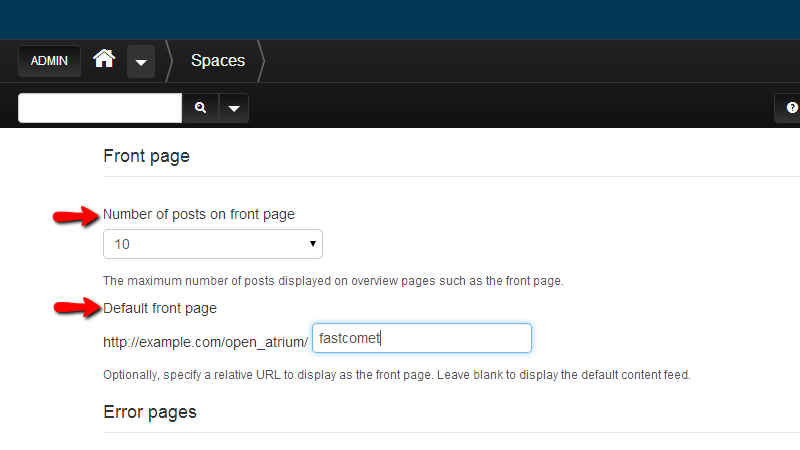 The first option in this section is the Number of posts on front page option where you will be able to set the amount of posts displayed on the front page of your website. The second option in this section is the Default front page option where you will need to configure the URL for the page you would like to be the new home page of your website. 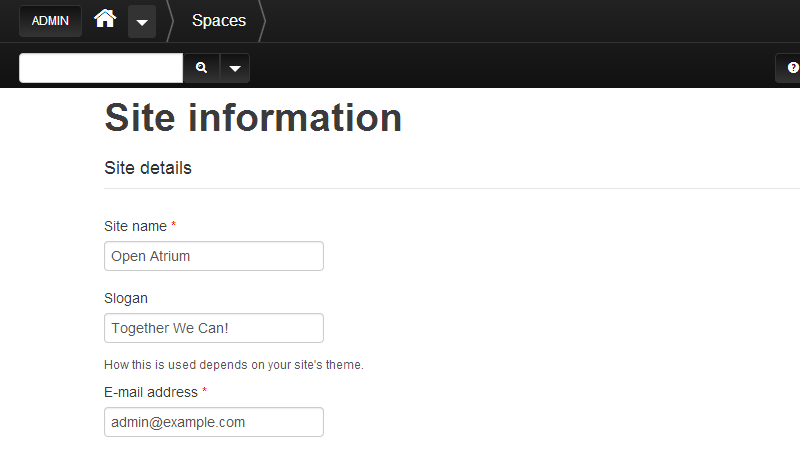 In the image above we have filled the URL with one of the spaces we have created. You should be able to fill it with the URL to the space, sub-space, section or any other type of separate page you would like to use as home page of your website. The last section is called Error pages and as the name suggests in this section you will be able to configure the error pages for your website. 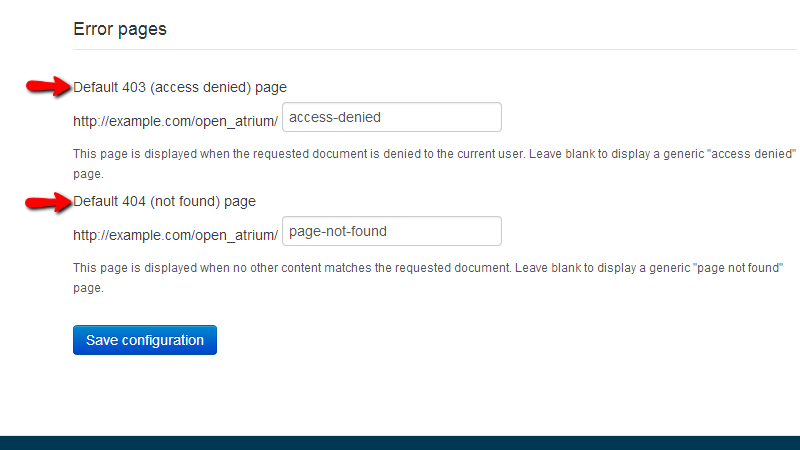 With the default installation of Open Atrium you will be provided with the custom error pages of the platform, however if you would like to build your own pages within the platform and to use them as landing pages when 404 or 403 error is faces here you should be able to do so with a simple change of the URLs of these pages. Once you are ready with the changes please scroll down to the bottom of the page and click on the Save Configuration button so you can be able to save the performed change. Congratulations! You have successfully changed the home page of your website to another page you have already created!